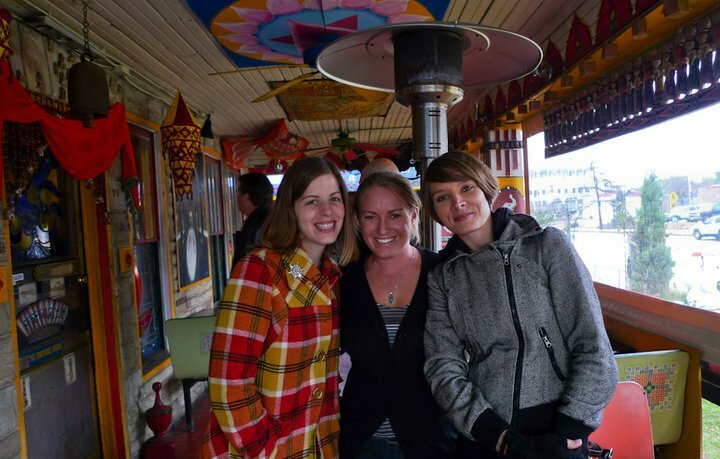 Me, Jocelyn and Amy at the Cosmic Cafe in Dallas this past weekend. A long time ago, in a land called Nacogdoches, while still in undergraduate, Nathan had a study buddy who ended up becoming one of our first - and closest - friends in town. Her name was Jocelyn and she was a biology major (like Nathan), an aspiring yogi (like me), and a lover of red wine (totally cinched the deal). After they finished their undergraduate careers, Jocelyn ran off to huge adventures and hasn't looked back since. She's worked in Alaska fishing for wild salmon and then racing dog sleds, spent time in Israel, and has been in Zambia for the last two years, volunteering with the Peace Corps. She just extended her contract and will be there another year, but was given a month off to come home and see her family for the first time since she joined. Nathan and I hadn't seen Jocelyn in nearly five years, so this weekend he, I, and Amy drove to Fort Worth to hang out and catch up before her return flight. Jocelyn was flying in from Arizona on Saturday morning, so Friday Amy, Nathan and I stayed in a hotel in Dallas called Element. If you ever need a place to stay near the Dallas airport, I highly recommend Element! It was a "green" hotel, very affordable, with a really nice continental breakfast and all kinds of eco-friendly amenities. My two favorites were the half or full flush option on the toilet, and the priority parking for those with fuel efficient vehicles. We got up early on Saturday and decided that we had time to go to a hot yoga class before picking up Jocelyn from the airport. This was my second hot yoga experience. The first time, I went to an actual Bikram studio. This time, the class borrowed a lot from Bikram, but it wasn't certified. I didn't mind. I really like hot yoga, but I don't think I'd want it make it my every day practice. I like the variety of my usual hatha classes. 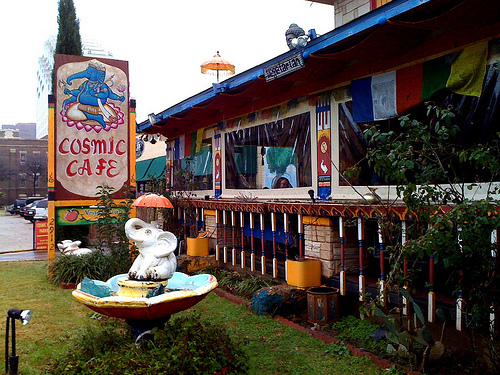 Once we had Jocelyn, we went to lunch at the Cosmic Cafe, a cute hippie place near the airport. 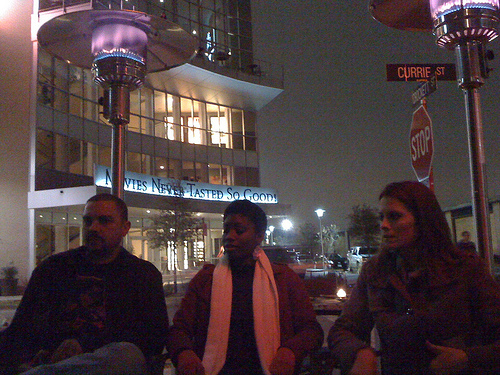 We hung out all afternoon and in the evening met up with some other friends and went restaurant hopping in downtown Fort Worth - drinks and appetizers at each place we visited. It was a cool way to see a variety of places, even if I was woefully under-dressed for most of them. City life! I loved seeing Jocelyn, and I loved the break from my little town. Whenever I hear about a friend who has gone off to explore the world and experienced things of which I have only dreamed, I can't help but get jealous. I sometimes wonder if I made the right decision by moving from New York to East Texas six years ago, whether I should have held off on the Masters program and the serious relationship and the dogs until I'd gotten some of this wanderlust out of my system. 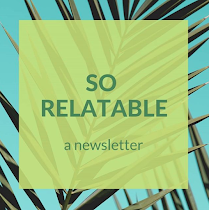 But last night, after we'd returned from our weekend of fun, I had a delicious dinner in the oven, a loving partner a few feet from me, and two exhausted dogs at my feet, and I realized that my life is an adventure too. More subtle than battling rattlesnakes in a bathroom or racing across the frozen expanse of Alaska, but an adventure nonetheless. 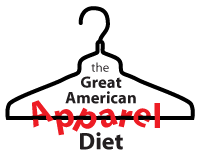 The Great American Apparel Diet! 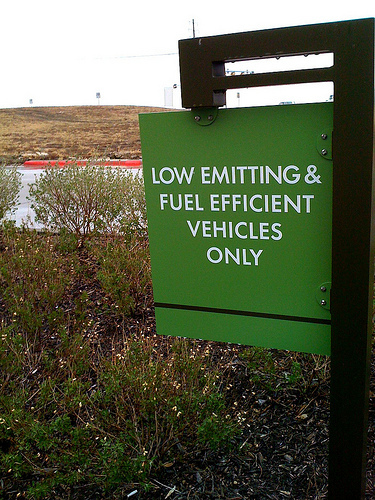 Some of us are motivated to curb our carbon footprint while others are more motivated to curb spending. Some are sick and tired of consumption in general while others are concerned about consumption and the environment. My reasons for abstaining from clothing purchases are very similar. First of all, I have everything I need. Period. There is no reason for me to cruise the sales rack of every department store and bring home things that I don't need and usually don't even wear. Second, working with what I have makes me more creative - I can't just buy a new dress when I have to go to a wedding. I'll have to remix something I already have. Third, I want to live more simply and save more money. Removing an entire category of expenses from my life will definitely help that. And fourth - as I'm sure you're all well aware at this point, I like a challenge. When I read about the GAAD diet on a friend's blog, I couldn't help myself! That said, I do have a few planned exceptions to my year of no-buying. Under the rules of the challenge, I am able to buy undergarments (which I appreciate) and accessories (which will be fun, especially as I get bored of my clothes). I also anticipate needing to replace my running shoes at some point before 2012. I've been meaning to buy two pairs of work pants forever, but I'm picky about pants so I haven't found anything suitable yet. I will allow myself this (necessary) purchase. And lastly, I need a pair of running tights. Right now, I run in my yoga pants when it's cold which isn't ideal. I've been waiting for the Houston Marathon expo to get a pair, and I will go forward with that plan! But otherwise: nothing. Nada. Ziltch. I'm going to live simply, work with what I have, and save major money. In Fort Worth, I kept my purchases to physical things - a yoga class, beer and food. I still spent a lot, but I feel like it was worth more. Have you taken the GAAD pledge, or something similar? I'm only two weeks into the challenge so I know it'll get harder as time goes on, and I can use any advice you have!